Among a burgeoning generation of contemporary Japanese women commercial filmmakers, the first of its kind, are Nishikawa Miwa and Ogigami Naoko. Both are well known and award winning filmmakers with substantial bodies of work. However, these two directors exist at opposing poles of cinema marketing, reception, and criticism. Analysis of their reputations and their public image as directors provides insight into how women are finding their footing in today’s Japanese film industry, particularly in the creation and maintenance of a directorial text or public persona. Using Robert E. Kapsis’ theory of director persona creation and transformation, I show how Nishikawa Miwa maintains a public image of film auteur and enjoys a privileged position among art cinema circles. By contrast, the overtly feminized marketing of Ogigami Naoko’s public image, or as I will explore the absence thereof, transforms the director into a commercial product. Underlying both personas is the thread of gendered subject positions and gendered marketing in which contemporary female film directors encounter industry mechanisms that package them as specifically female film directors. In his work on film legend Alfred Hitchcock, Robert E. Kapsis challenged the idea that director reputations are generated by the “individualistic” or “masterpiece” theory in which reputations are based primarily on the director’s works. According to this line of thought, “if an artist’s stature improves during his or her lifetime, a major reason is that the artist’s work got better, that is, more in line with the prevailing aesthetic standards of the art world” (Kapsis 1992, 16). The arbiters who pass judgement on a directors’ work and the director’s reputation are the evaluative voices belonging to reviewers, critics, and scholars who engage in a process of “consensus building in the relevant art world” (Becker 1982, 359). However, as Kapsis argues, this prevailing theory ignores far more tangible and objective factors that contribute to a director’s public text or image. To begin with, sponsors (studios, producers, managers, etc.) have an active role in promoting or establishing the reputation of an artist as they profit from the exposure (Kapsis 1992, 16). Moreover, the artists themselves are active agents in the construction of public personas and reputations, as owners of their public text. This engagement of an artist in their own star text is a central concept in star studies (Dyer 2008), but is often overlooked when it comes to directors, who are also manufactured stars of publicity machines, both self-directed and otherwise. Both sponsors and directors engage in the creation and maintenance of marketing materials, a public portfolio, that can cast the director as cinema auteur or commercial crowd-pleaser. In working with the public image of Hitchcock, whose reputation began in so-called lowbrow “thriller” entertainment, Kapsis analysed the mechanisms and materials used to transform the director from a commercial entertainer to a celebrated auteur, from a “craftsman” to an “artist” (Kapsis 1992, 1). In his Hitchcock case study, Kapsis identified four key components involved in the production of a director persona. The first is the crafting of a “biographical legend” or “public reputation.” This narrative lends a perceived “reality” or “truth” to the director’s products that encourages reading films as perceived extensions or expressions of the director’s projected, public self. In accord with the practiced tenets of auteur theory, the promoted reputation of the filmmaker “can influence how viewers derive meaning from any given film” (Kapsis 1992, 11). As such, the director’s careful articulation of her own biography is central to constructing an atmosphere of legitimacy and gravitas to both her films and spectatorial meaning making. Kapsis’ second factor concerns “conventions of critical discourse about genre” (12) that interrogate and negotiate “genre meaning systems.” A director, focusing on a particular genre and its conventions, establishes a consistent body of work that facilitates analysis across film texts. This worked well in Kapsis’ study on Hitchcock, a director operating in a particular historical and industrial context. However, it does not work quite so neatly in a contemporary setting in which directors operate more independently from a studio industry (as is currently often the case in Japan), and are more influenced by a global environment of postmodern expressions and experimentation across disparate media formats. Rather, I would amend Kapsis‘ point to meet contemporary conditions (and the more local context of Japanese genre deconstruction) by replacing consideration of a director’s genre with consideration of a director’s oeuvre as a cohesive whole in which motifs, style, and production contexts span films. In the case of Japanese cinema this is particularly true for those directors that seem to defy genre classification: e.g. Ogigami Naoko, Iwai Shunji, Tanada Yuki, Kurosawa Kiyoshi, and Miike Takashi. Thirdly, Kapsis places importance on “the critical discourse on cinema, which refers to more general criteria affecting how reviewers from a particular time period evaluate current or past films” (12). He notes that in American cinema, “writers in general dismissed the vast number of popular entertainment films…their blatant commercialism was considered incompatible with artistry and seriousness” (12). This bears true in criticism of Japanese cinema as well (Laird 2010) and divides directors into two opposing groups: commercial and high art. To evaluate the Hitchcock metamorphosis, Kapsis turned to the Hitchcock Collection for his study, a collection that “includes scripts, papers, production notes, publicity files, correspondence, and memorabilia” (xv), as well as taped interviews and correspondence with François Truffaut, housed at the Academy of Motion Picture Arts and Sciences. In considering these resources, I would bring Kapsis’ argument up to date here by suggesting that we think of his resources as not just the career documents of a director, but as the texts that support the creation and maintenance of the director’s reputation. As such, are these not actually a director’s paratexts, the marketing materials that define and support director texts? Jonathon Gray defines media paratexts as the (mostly marketing) materials that surround, amplify, explain, and contextualize a text. In short, Gray argues that “paratexts are not simply add-ons, spinoffs, and also-rans: they create texts, they manage them, and they fill them with many of the meanings that we associate with them” (Gray 2010, 6). With regards to Kapsis’ study, film paratexts are not only a mechanism of context for a particular film or its stars, but are also meaning generators for individual directors. In his focus on Hitchcock, there is an element that is overlooked in Kapsis’ analysis: the role that gender plays in gendered marketing campaigns that addresses gendered audiences and crafts a gendered director persona. This is no doubt because Kapsis studied a celebrated male director working in a male dominated (thereby male normative) industry. However, in the case of contemporary female directors in Japan, director gender and gendered imagery plays a primary role in shaping the director’s public persona. Moreover, the extent to which the director is feminized by her marketing paratexts can play a significant role in her designation within the commercial/auteur value-laden dichotomy. To address the paratextual gendered marketing of contemporary Japanese female directors, and how polarised variances in director texts place these filmmakers in the commercial/auteur dichotomy, I will now turn to a comparison of two prominent directors: Nishikawa Miwa and Ogigami Naoko. In considering their respective director personas, I take into account Kapsis’ four elements: (1) the biographical legend; (2) consistent motifs and stylistic techniques within film oeuvre; (3) critical discourse and reception; and (4) marketing paratexts. Director, screenwriter, and novelist Nishikawa Miwa holds ground at the perceived forefront of the current generation of Japanese female filmmakers. However, she stands noticeably apart from her contemporaries in both reception and acclaim. As I will show in the case of Ogigami Naoko below, women directors are categorised and marketed as particularly women directors in much the same way that Japanese women writers have been partitioned as women writers (Ericson, 1996). Nishikawa Miwa’s director persona, however, successfully transcends gendered demarcation. Nishikawa is promoted as a cinema auteur–a status attainable only by men in Japan until recently, as per the mechanisms outlined by Kapsis. Nishikawa Miwa’s biographical legend is steeped in pedigree. As opposed to other contemporary directors who have educational backgrounds in small universities, art schools, or film trade schools, Nishikawa is a graduate of Waseda University, Japan’s most prestigious private school, with a degree in literature. This concise biographical information is included in every Japanese language Nishikawa promotional profile and crucial to her biographical legend. In short order, Nishikawa distinguishes herself from those with a technical background in commercial filmmaking. Literature, as opposed to film, is de facto coded as high art and the academic study, as opposed to a craftwork training, aligns Nishikawa with other directors who hail from the same literary lineage. Moreover, while at Waseda, Nishikawa became the protégé of internationally renowned director Kore’eda Hirokazu, also a Waseda alumnus with a background in literature. She worked on his widely acclaimed film Wandāfuru raifu (After Life, 1998), and Kore’eda later financed her first full-length feature film Hebi ichigo (Wild Berries, 2002), lending an important voucher of credibility and prestige to her debut film. What this biographical legend creates for Nishikawa is the foundational image of a literary (high art) filmmaker with the connections and support of living legends. In turn, her films are often praised for attention to narrative craft, in no small part because reviewers come to her films with the knowledge of her background and kone (social and professional connections). When engaging with a Nishikawa film, the audience is preconditioned for an auteur work that merits serious consideration. For her part, Nishikawa sustains this aspect of her persona by not only writing her own scripts, but by writing novels and editing essay collections, all of which effectively reinforce her high art auteur identity within literary and filmic traditions of both creative and intellectual authorship. Nishikawa’s biographical legend, Kapsis’s first factor, is reinforced by the aesthetic and stylistic consistences within her film oeuvre, which is Kapsis’s second factor. In her films, Nishikawa displays a studied practice of canonical techniques that remind critics strongly, and nostalgically, of what has been deemed Classical Japanese Cinema. 1 In some cases she does this outright through adaptation of canonical literary texts: Nishikawa has both directed and written screenplays of works by authors Dazai Osamu and Natsume Soseki. Her original works convey a cohesive display of conventional techniques, imagery, and motifs that include direct allusions to prominent directors. Critics liken her style and cinematography choices—low lighting, long takes, methodical pacing, atmospheric cutaways, jazz and blues soundtracks used ironically or discordantly, and a precise application of absolute silence to articulate psychological interiority—to the salad days of Japanese cinema. As critic Kimura Mariko wrote, “rare for a young director [one of Nishikawa’s traits is the] cinematography of classic Japanese cinema” (Kimura M. 2006, 189). Nishikawa’s films are celebrated because they resemble and reflect a legacy of art cinema and are set apart from contemporary commercial trends invested in happy endings and saccharine melodramas. Nishikawa’s films, however, are not evaluated at a distance, but rather often by a jury of her peers (or elders within a socially rigid hierarchy). Nishikawa herself participates in the critical discourse and reception of film in Japan, Kapsis’ third criteria, thereby shaping her public persona as not only a director of art cinema, but as an authority on film history and film critique. In addition to public promotion of her own films, Nishikawa is an active member of the analytical and philosophical cinema community. She participates in published roundtable discussions, writes essays on film and literature, and engages in discussions about the current status of Japanese cinema with other noted directors. Her presence among cinema critics, standing shoulder to shoulder with noted auteurs, frames Nishikawa as an intellectual director, one who is engaged in shaping currents in her field. While Nishikawa performs the persona of auteur across a variety of media platforms including interviews and published essays, the marketing media paratexts created about her and her works, Kapsis’s fourth component, similarly reinforces this position. Before discussing Nishikawa’s paratextual auteur presence, there are a few paratext platforms specific to Japan that require brief introduction. As in any global or local movie market, Japanese films run through a promotional machine of trailers, posters, magazine spots, and music video crossovers. 2 In Japan, there are three paratext formats uncommon to other movie markets. One, small advert cards distributed to commercial venues including ticket agencies, box office counters, convenience stores, books stores, music stores, and video rental shops. They sit in piles next to the register, are highly stylised, and usually include cross-marketing product information (see Figures 1 and 2). Two, what are called chirashi. Found in thick stacks in movie theatres, rental shops, book stores, department stores, and convenience stores, chirashi are take-home fliers, free and collectible. They are double-sided with a scaled image of the poster on the front and screening information with partnered advertising on the back. Chirashi are a standard form of advertising used by many Japanese industries to promote events, goods, and services (see Figure 3). Three, the panfu, short for panfureto, or pamphlet (see Figure 4), sold at movie theatres as a souvenir, retailing from 700 to 1500 yen. Panfu vary tremendously in content, size, and shape, but are carefully designed to convey the aesthetic of the marketed film. Containing a substantial amount of film-related material, panfu arguably do the most semiotic work to established a studio/distribution backed paratextual image of a film. 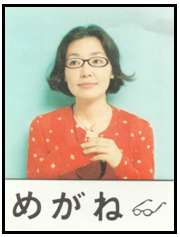 Figure 1: An advert card for Ogigami Naoko’s film Megane (Glasses, 2007). The card is folded accordion style such that when flat, the film title and icon (a pair of illustrated glasses) is visible from the bottom-most layer while the topmost image of actress Kobayashi Satomi lies on top. In collapsed form as seen above, the advert is roughly 3.5 x 4.5 inches. Figure 2: Top: advert card for Ogigami Naoko’s film Megane (Glasses, 2007). When unfolded and pulled to its full length, the frontside of the advert reveals portraits of the ensemble cast (here rotated to fit image and not to scale with Figure 1). Bottom: the backside of the advert contains film information, stylised illustrations, and cross-merchandise product placement. Figure 3: Examples of chirashi. Left: the front and back sides (left and right respectively) of a chirashi advertising a double feature screening of Nishikawa Miwa’s films Hebi Ichigo (2002)and Yureru (2006). Right: the front and back sides (left and right respectively) of a chirashi advertising the theatrical release and Roadshow run of Yasuda Mana’s film Shiawase no suicchi (Happiness Switch, 2006). Chirashi are typically uniform at 7×10 inches. 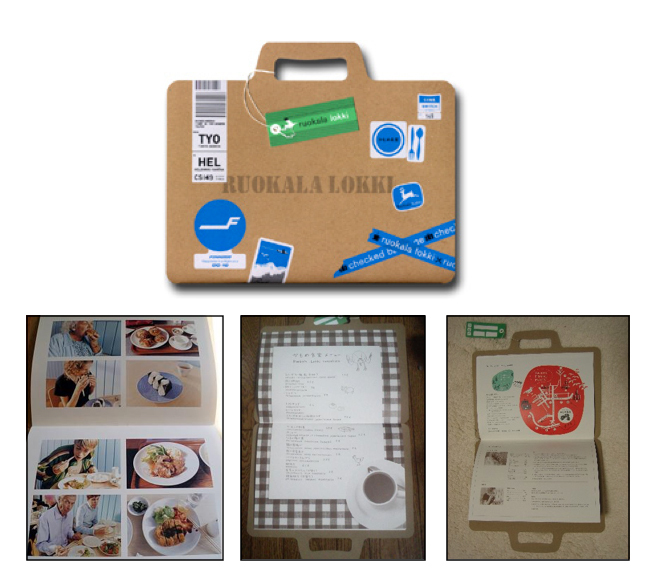 Figure 4: The panfu for Ogigami Naoko’s Kamome Shokudo (Seagull Diner, 2006) resembled a suitcase in a nod to the film’s central theme. Inside, the booklet contained film stills, bonus photographs, a mockup of the protagonist’s diner’s menu, tourist information about Helsinki (including filming locations), and the standard supplementary publicity fare (e.g. plot synopsis and actor interviews). While many of these specialised paratexts are designed with an element of play, particularly the ones targeting a young (or female) demographic, Nishikawa paratexts are straightforward, with a serious and often scholarly tone that reflects her auteur persona and literary background. The posters and chirashi for her films depict brooding melodramas, represented by star couplings (redolent of the parallelism at work in her tightly written narratives) in stern postures with dour expressions (see Figure 5). Nishikawa panfu include high-brow critical essays in addition to the more typical material such as interviews, actor biographies, and plot synopses. Some panfu even include poetry. The panfu for her film Hebi Ichigo (2002), although neon green, is simple and designed to resemble a book cover; an incorporation of her literary background. The panfu for Yureru (2006) resembles a paperback with nothing but the film’s title in white on the cover with contents are uncharacteristic for a panfu: written essays by critics and novelists with few star images and film stills. Dear Doctor’s panfu is a miniature book with text in a typewriter font. Collectively, these design elements that conjure up the figure of a literary auteur director are supported by video paratexts of Nishikawa, both interviews and making-of specials that appeared online (e.g. official film websites), on television, and in her DVD extras. In clips selected for marketing, Nishikawa cuts a strong and impressive figure. She is eloquent and thoughtful. She is featured in scenes in which she leads meetings and gives orders in a no-nonsense manner. She is cast as impressive and not a little awe-inspiring. Figure 5: Chirashi for Nishikawa Miwa’s three most recent full-length feature films. Left to right: Yureru (Sway, 2006), Dear Doctor (2009), and Yume uru futari (Dreams for Sale, 2012). Nishikawa’s films are clearly billed as serious dramas that play on dichotomous couplings arranged in near graphic matches that are strategically divided by design elements: character Hayakawa Takeru in Yureru (played by heartthrob Odagiri Joe, obviously milked for star power in the advertising) is set against himself; the young, city-slicker intern and the older, countryside doctor in Yureru are matched in profile but contrast in nuanced meaning-laden angles; and the two bedraggled halves of the marriage partnership in Yume uru futari are split by the film title in yellow. Ogigami Naoko’s director persona, a commercial filmmaker tied to branding and cross-marketing, is the direct antithesis to Nishikawa Miwa’s auteur director persona. Unlike Nishikawa, Ogigami Naoko has been imaged as a female director who makes films for women. 3 While Nishikawa is the favourite of awards critics, Ogigami Naoko seems to be the favourite of moviegoers, particularly women (Schilling 2012; “News Release” 2012; mussesow 2012). In terms of consideration for auteur candidacy, these are strikes against Ogigami since, to paraphrase Kapsis, critics have a tendency to dismiss popular entertainment films because as commercial products, their very commercialism is considered “incompatible with artistry and seriousness”. Moreover, within film criticism and popular discourse there is a bias in criticism against what has elsewhere been decried as the “chick flick” (e.g. Huyssen 1986, Kimura T. 2006). If Nishikawa is the image of the auteur persona, then Ogigami, a feminized commercial filmmaker, seems to serve as her foil. Ogigami’s biographical legend is one of technical training and independent filmmaking. A Chiba University Image Science program graduate, Ogigami also earned a graduate degree in film production at the University of Southern California in the U.S. She chose to study filmmaking abroad because she felt that the then extant training curriculums at Japanese film production schools were not a good fit for her (Lang 2011). This move, in some ways a rejection of the domestic industry and film lineage, positions Ogigami outside not only the academic connections central to Nishikawa’s career, but also Japanese cinema traditions. With a foreign degree and training in cinematography, Ogigami returned to Japan as not a protégé of a legendary filmmaker, but a self-financed independent filmmaker. Her first domestic short film Hoshino-kun Yumeno-kun (2000) won the Best Music Award, the Audience Award, and the Scholarship Prize at Japan’s PIA Film Festival (PIAFF). In other words, at a populist festival Ogigami came away with populist prizes. Since the festival wins, Ogigami has relied on support from small production companies who, in turn, garner funds from a product-oriented market. As such, Ogigami is more overtly a commercial filmmaker, in terms of production assistance alone, and she often relies on cross-marketing with tourism businesses and cross-merchandising. Ogigami’s biographical legend, and the historical means to her filmmaking, fashions her as not an auteur stemming from literary or scholarly influences, but as a working commercial director. Like Nishikawa, Ogigami has developed a consistent filmmaking style throughout her body of work. With each successive film, Ogigami develops an ever increasing preference for environmental cutaways, the illusion of flat space derived from bright lighting and defined colours, deep focus long shots, carefully centred subjects, attention to negative space, and frame-within-frame composition. Her cinematography is at once calming and open—peaceful—while at the same time rigidly and meticulously composed to balance space and contrast colour: an assiduously manufactured illusion that cultivates harmony and natural beauty. Thematically, her films have been labeled as “iyashi-kei eiga”, or “films that provide emotional healing.” And yet, a consistent style and thematic approach do not lend Ogigami high art gravitas. Rather, Ogigami’s works are equally often characterised/criticised as superficially atmospheric and environmental, with an emphasis on surface visual composition over narrative depth. While it’s true that her story lines are perhaps understated and that her films feature characters that transform from a state of ennui or dissatisfaction to personal acceptance and emotional peace through accomplishment or “healing”, her films are nuanced and express psychological depth and complexity, not to mention deft comedic timing, that her detractors overlook. However, it is the iyashi-kei healing image of an Ogigami film, the perceived aesthetic that is coded as light fare, that is alive in contemporary discourse and, more importantly, maintained by paratexual development of the director persona. While over the years Ogigami has refined a cinematic style, her films, and thereby her director persona, have also been highly stylised by associated marketers through a variety of crafted paratexts. Early on in her career, Ogigami’s films were marketed to young audiences. Pictured below (in Figure 6) are the posters for her first two feature length films after her PIAFF win: Barber Yoshino (2004) and Koi wa go-shichi-go (2005). The posters clearly sell youth-oriented fare and borrow the aesthetics of the then-dominant genre of seishun eiga, or “youth films”. The poster for Barber Yoshino riffs on the school uniform, arranging the protagonists who, in the film, all suffer from a uniform haircut, in matching choir vestments. The font is stylised to resemble a barber’s pole, and cartoony illustration lends the poster that certain kawaii (cute), trendy element. The posters for Koi wa go-shichi-go sell the youth film aesthetic even more directly. One is an explicit allusion to an extremely successful seishun eiga funded by the same company, Suwingu Gāruzu (Swing Girls, 2004) (see Figure 7), and the other captures the seishun eiga school club spirit by incorporating the main characters into the image, each equipped with their personal quirky props, against a bright yellow background. These posters were designed to sell a specific genre to a specific market, casting the films and the filmmaker as commercial media. Figure 6: Poster and chirashi images for Ogigami’s films Barber Yoshino (2003) (left) and Koi wa go shichi go (middle and right). 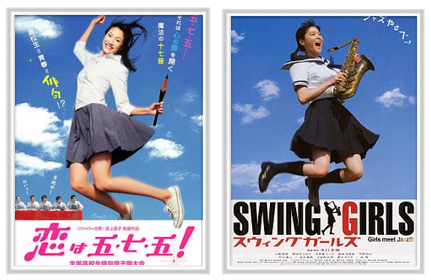 Figure 7: The poster designs for Koi wa go shichi go (left) and Suwingu Gāruzu (Swing Girls, 2004) (right). And yet, it is hard to imagine the films themselves doing well with a youth market. Working our way backwards, Koi wa go-shichi-go is a parody of the seishun eiga. Ogigami takes the youth film to its absurd extreme, playing up stereotypes and deconstructing the formulaic inanity of the genre. Likewise, Barber Yoshino is a comedy, as well as a commentary on vestigial cultural traditions and entrenched national identity—heady themes for a teen market. Moreover, the protagonist, the barber Yoshino herself, is established actress and comedienne Motai Masako, an actress decades well outside a teen demographic. So, in fact, Ogigami’s early films themselves were likely not aimed at a youth audience, although depicted as such, but were rather films for and appreciated by adults. Unlike Nishikawa’s paratexts that promote a unified director persona, there has been a disconnect between Ogigami’s films and their marketing. From early on, the director persona of Ogigami, difficult to image in mismatched biographical legend, film style, and paratext marketing, is subsumed by the role of film as commercial product. After Koi wa go-shichi-go, Ogigami collaborated with production company Paradise Café, a young organisation with experience in television production and commercial advertising, to make the crowd-pleasing Kamome shokudo (2006), followed by the equally successful Megane (2007). To date, Ogigami continues to partner with Paradise Café and the company has crafted an adult-oriented image of the director’s films, an iyashi-kei image. While Ogigami continued to develop the cinematic flavour established in her earlier films, Paradise Café, her production, distribution, and advertising company, created an Ogigami brand through the creation and maintenance of paratexts with a hardened style. To begin with, the company devised a clear colour scheme for an Ogigami look: blues and whites (see Figure 8). Secondly, the stars are an important element of the marketing, particularly in the posters and chirashi. While this is true historically for most Japanese films, an Ogigami film marketed by Paradise Cafe features the cast as a recurring ensemble lined up in roll call configuration. Thirdly, this star lineup is balanced within the imagery such that the players are dominated by their environment. This reinforces, to some degree, Ogigami’s filmmaking style to be sure, but the paratexts amplify this motif by including extensive imagery of food as well as recipes within the various marketing materials. It is not a stretch to suggest that Paradise Café is deliberately appealing to a consumer demographic that has an intimate, day-to-day relationship with food preparation and kitchen spaces. After all, this company, which actively seeks and supports female directors and targets female audiences (beginning with Ogigami as I will show below), is itself named Paradise Café. Figure 8: A variety of paratexts selling the Ogigami brand established by her two films Kamome Shokudo and Megane. Unlike Nishikawa, who cuts a commanding figure across marketing paratexts and public performances, Ogigami appears to be a shy director both in person and in media. In fact, within many of the promotional materials for her films, Ogigami disappears. Or, considering that her director persona was already lost among conflicting representations early in her career, Ogigami continues to be absent. While the paratexts establish distinct visual and thematic features of an Ogigami style, they simultaneously remove the figure of Ogigami as a director, as a labourer, as a decision maker, and as an artist. In other words, the marketing materials sell the film and the filmic world, but not the filmmaker. Unlike Nishikawa, it is difficult or even impossible to find Ogigami the director in her marketing materials. Although she makes public appearances to promote her films, she does not seem to contribute to mass-marketed paratexts. Unlike Nishikawa and other auteur filmmakers, the panfu for Ogigami films are curiously missing essays or production notes from the director. Rather, her presence, at best, is relegated to a few quotations drafted by an anonymous copywriter. Likewise in DVD extras, behind-the-scenes footage or bonus videos that focus exclusively on the cast and crew. On rare occasions Ogigami appears in the background briefly before slipping out of frame. The result is that the idea of Ogigami becomes not a director persona, but a commercial product and an idea—a style, an aesthetic, a collection of celebrities, a vehicle—rather than the figure of an auteur. Between 2007 and 2010, Paradise Café and sister unit Suurkiitos produced and distributed two other films: Pūru (Pool, 2009) and Mazā Wōtā (Motherwater, 2010). These two films look (meaning they appear in marketing paratexts generated by the production companies) like Ogigami films (see Figure 9). They feature the same blue and white colour scheme, the same line up of protagonists, the same cast (in different character roles), the same high-contrast flood lighting, and the same visual dominance of setting and environment. In fact, these films are described by spectators as being Ogigami-esque (e.g. Shinohara 2011; pretty_kitten 2010; cubismo 2010; shokora 2011). In popular talk on fan blogs and press releases, there was even the implication that Pūru was a third act in an Ogigami series, and that Mazā Wōtā was the fourth instalment. There is often confusion by viewers as to whether or not the films might actually be by Ogigami (e.g. kaidōwoiku 2011; poomaa_chen 2009; pat03 2009; kanon 2010). However, Pūru was directed by TV screenwriter Ohmori Mika, and Mazā Wōtā was directed by Matsumoto Kana, about whom so little is publicised in connection with the film that in the public eye she almost doesn’t exist: an extreme case of what we see happening to Ogigami the person as opposed to Ogigami the name. Figure 9: A variety of paratexts selling the Ogigami brand of films not actually by Ogigami: Pūru and Mazā Wōtā. Although Ogigami Naoko the director was not involved in the making of either film, the association to Ogigami Naoko the name and product was created through an arsenal of marketing paratexts that enforced a serialised visual repetition and fixed similarity. It didn’t matter that Pūru and Mazā Wōtā weren’t Ogigami films because they promised to bring the same sense of aesthetic, atmosphere, and iyashi healing delivered by an Ogigami film. Moreover, the repetitive aesthetic of the advertising bred a consumer acquaintance with the acting troupe. By the time Mazā Wōtā came out in theatres, Ogigami fans and promoters were beginning to think of the films as a bona fide series (emi 2011; kumanezumi 2010; chloe 2010; maikazuki290 2011; “Kamome shokudō shirīzu saishinsaku: Tokyo oashisu yokokuhen kaikin! Tokyo wo butai ni yuttari to hirogaru kūkikan! 2012; “Kamome shokudō, Megane, Pūru, Mozāuōtā no sugi wa Tokyo oashisu” 2011; Saito 2010). Many of the films promoted by Paradise Café—Pūru and Mazā Wōtā followed by Tokyo Oasis (dir. Matsumoto, 2011), Shiawase no pan (Happiness Bread, dir. Mishima, 2012) and Ogigami’s latest film Rentaneko (2012) are, like Kamome Shokudo and Megane, directed by women. In an industry still dominated heavily by men, this does not seem to be a coincidence. Paradise Café is invested in two overlapping marketing strategies with the same focused goal. On the one hand, they are implementing the now quite popular and effective Japanese marketing system known as “lifestyle creation”. On the other, they are creating and fostering female filmmakers in a direct attempt to target a very specific demographic: women between the ages of 20 and 34, known as the “F1-sou”. Gabriella Lukács identifies lifestyle creation marketing as the next level of product placement in media in Japan (2010). Rather than individual products implemented into television and film narratives (that would be branded entertainment), the mise-en-scène itself as a manifestation of trends is the marketing campaign. In other words, the lifestyles of the characters are the important feature of the media, and these lifestyles function as forms of product placement. 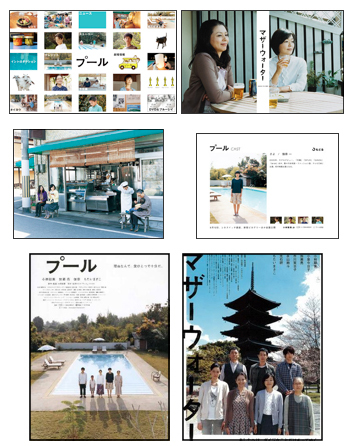 In the case of the Paradise Café brand of Ogigami-esque films, lifestyle creation takes the shape of iyashi healing in which known stars who feel like friends live in almost tenable atmospheres and domestic settings that spectators are encouraged to recreate in their own lives by recreating the lifestyle consumption habits of the characters on-screen. Iyashi healing happens through cathartic viewing pleasure, but films teach the spectators how to achieve personal prolonged iyashi outside the theatre through commercial consumption. Paradise Café and Suurkiitos deploy lifestyle marketing not just in the films they produce, but also through their paratexts, particularly the panfu, which read increasingly like lifestyle catalogues. The star interviews and informational essays emphasise the emotional journey of the filmmaking process and how the players and staff themselves incorporated the emotion of the film into their daily lives. Selected film stills overwhelmingly feature imagery of the domestic spaces. What is in many other cases a piece of movie memorabilia, the Ogigami brand of panfu crafted by Paradise Café is also a kind of instructional manual for lifestyle creation, and it is an instruction manual aimed at adult women. According to Lukács, the shift to lifestyle marketing in television was “a response to women’s growing role as consumers” (Lukács 2010, 37). This is undoubtably also the goal of Paradise Café and the motive behind its attention to female film directors. Since 2000, women between the ages of 20 and 34 have out-purchased any other demographic at the box office (Nakamura 2007). Distributors and producers have been actively targeting this demographic as a result, and one method of doing so has been to produce works by female talent: in other words, films for women by women. Paradise Café’s investments in women directors is a strategy to attract women consumers, which means that first and foremost their films are commercial, as opposed to auteur works of art. The stories and characters for each film across directors are quite distinct, and yet the repetitive casting and art direction forges a union between works. This consistency is conveyed to consumers through marketing paratexts that draw on carefully crafted female authorship (while simultaneously erasing that authorship in the creation of a line product), with an emphasis on women’s special interests. Nishikawa and Ogigami represent two opposing poles of cinema marketing—auteurism pitted again commercialism. Moreover, this is a gendered polarisation. In biographical legend, a consistent body of work, investment in film criticism, and the manipulation of marketing paratexts, Nishikawa has moulded a director persona, or text, that is decidedly auteur. The Japanese film auteur predating Nishikawa is decidedly male. Before Nishikawa’s current generation, there exists no precedent of independent Japanese women working contemporaneously, successfully distributing as commercial filmmakers with significant bodies of work. 4 The first Japanese female filmmaker was Sakane Tazuko, who made her first and only commercial film in 1936. The second female filmmaker was celebrated actress Tanaka Kinuyo, who made six films, the first in 1953. Since Tanaka, there have been only a handful of women scattered across the decades who have released commercial films. However, it is only in the contemporary moment that many women at once are making and distributing successive films. Like Paradise Cafe directors Ogigami Naoko, Ohmori Mika, Matsumoto Kana, and Mishima Yukiko, these women, collectively, are labeled by industry marketers as female film directors. But not Nishikawa Miwa. Nishikawa escapes the gendered label of female director through careful maintenance of her director persona as auteur in a long line of male, or normative, auteur directors. Nishikawa has said on many occasions that she wants to be considered a director and not a female director. This is a strategic alignment to be sure: legitimacy involves—and in the view of many of the participants, necessitates—disavowing a gendered subject position. Nishikawa, however, does more than just lip service in interviews. She sidesteps issues of gender identification by similarly sidestepping overt issues of gender in her films. While Nishikawa takes a favourably neutral position by embracing conventional imagery, representations, and style, she also forefronts heteronormative male characters and male-oriented narratives, a dominance that is clear even in the Nishikawa film paratexts. With regards to this attention to male characters and male narratives, Nishikawa claims, “I didn’t particularly feel like I was making a story about men. I think all of us have masculine and feminine elements within us. I live my life as a woman but it was like I was exploding those aspects of me that are male onto the screen” (Wilentz 2007). 5 In so saying, Nishikawa takes the disavowal of being a woman director one step further: she seems to have taken on the performative position of a male director. This position is a privileged position made possible by and central to her established director persona. Unlike Nishikawa, Ogigami privileges female actors and female-oriented narratives. Whereas Nishikawa draws audiences with the combination of a young male star and a veteran male favourite, Ogigami reuses an ensemble cast of older actresses who portray female characters that find happy endings outside the staid confines of romantic ever-afters or maternal responsibilities. In fact, none of Ogigami’s characters are married, are rarely in romantic relationships, don’t live with their parents, and don’t have children. Instead, the women in Ogigami films form friendships with each other as they pursue their own interests. In so doing, however, Ogigami creates something of a filmic “woman’s world” by literally creating a cinematic world in which mostly just women exist. Problematic as they are, the Paradise Cafe paratexts reinforce the emotional woman’s world of Ogigami’s films. While certainly not a perfect reinvention of cinematic gender roles—contingent as it is on utopian circumstances—Ogigami’s works are an important step in breaking down a legacy of rigid and tired on-screen stereotypes, particularly due to the inclusion of older actresses and new roles. And yet, Ogigami’s films are criticised as light fare that values surface over content. Comparison of the Nishikawa and Ogigami director personas reveals the problematic dichotomies women directors must navigate in contemporary film marketing and the maintenance of director status. Both filmmakers adamantly insist that they do not set out to make films as women or as female directors, and yet it is clear that both filmmakers are involved in paratextual strategies that have a underlying connections to gender. Nishikawa’s disavowal of a female subject position and embrace of a dominant male legacy is key to her director persona. The overtly feminized, commercial marketing of Ogigami’s films is the key to her absence. Colleen Laird is Lecturer of Japanese Studies at the University of North Carolina Greensboro, PhD candidate at the University of Oregon (East Asian Languages and Literatures), and Monbusho alumnus. Her dissertation, entitled ‘Sea Change: Japan’s New Wave of Female Filmmakers,’ concerns female directors, female audiences, and gendered exhibition spaces in Japan. She is the author of ‘Japanese Cinema and the Classroom’ (Jump Cut 2010), ‘Star Gazing: Sight Lines and Studio Brands in Postwar Japanese Film Posters’ (Journal of Japanese and Korean Cinema), as well as several pieces in The Directory of World Cinema: Japan, 2nd Edition (ed. John Berra, Intellect). Becker, Howard. 1982. S. Art Worlds. Berkeley: University of California Press. chloe. “Motherwater.” 2010. personal blog. paperboy&co. Accessed: August 02 2012.
cubismo. “Customer Review of Pūru.” 2010. Amazon Japan. Accessed: August 02 2012. Dyer, Richard. 2008. Stars. British Film Institute. 2nd Edition. emi. “Pūru to tai no gurīn karē.” 2011. personal blog. nifty.com. Accessed: August 02 2012. Ericson, Joan E. 1996. “The Origins of the Concept of “Women’s Literature.” In The woman’s hand: gender and theory in Japanese women’s writing. Eds. Paul G. Schalow, Janet A. Walker. Stanford University Press. Gray, Jonathon. 2010. Show Sold Seperately: Promos, Spoilers, and Other Media Paratexts. New York and London: New York University Press. Huyssen, Andreas. 1986. “Mass Culture as Woman.” After the Great Divide: Modernism, Mass Culture, and Postmodernism. Indiana University Press. kaidōwoiku. “Amazon Customer Review.” 2011. Amazon Japan. Accessed: August 02 2012. “Kamome shokudō, Megane, Pūru, Mozāuȏtā no sugi wa Tokyo Oashisu.” 2011. Nikkei. August 02 2012. “Kamome shokudō shirīzu saishinsaku: Tokyo Oashisu.” 2012. Tokyo Carendā. Accessed: August 02 2012.
kanon. “Motherwater.” 2010. Blog.livedoor. Accessed: August 02 2012. Kapsis, Robert E. 1992. Hitchcock: The Making of a Reputation. University of Chicago Press. Kimura, Mariko. 2006. “Nishikawa Miwa.” Yuriika: shi to hihyō. Tokushū: kantoku joshikei fairu 38 n. 521: 189. Kimura, Tatsuya. 2006. “Eiga wa onnanoko-tachi no mono.” Yuriika: shi to hihyō. Tokushū: kantoku joshikei fairu 38 n. 521.
kumanezumi. “Motherwater.” 2010. blog.goo.ne.jp. Accessed: August 02 2012. Laird, Colleen. 2010 “Japanese Cinema, the Classroom, and Swallowtail Butterfly.” Jump Cut. 52. Lang, Doris; Nordstöm, Johan. 2011. “For Foreigners the Japanese Toilet Really Must Be Something Amazing: And Interview with Ogigami Naoko.” Film International. Lukács, Gabriella. 2010. Scripted Affects, Branded Selves. Durham: Duke University Press. Nakamura, Keiji. 2007. Eiga Sangyō No Dōkyō to Karakuri Ga Yoku Wakaru Hon Tokyo: Shūwa System. “News Release.” 2012. Ed. Tower, The Prince Park. Tokyo. “Nishikawa Miwa kantoku, kannu wo hakate.” 2006. Kinema Junpō.1460: 43.
maikazuki290. 2011 “Kantoku Wo Ogigami Naoko Ni Modoshitekure.” user review. Yahoo! Japan. Accessed: August 02 2012.
mussesow. 2012. “Kokoro No Anaboko Ni Wa, Neko Inerugī Wo Dȏzo.” user review. Yahoo Japan. Accessed: August 1 2012.
pat03. 2009. “Ohmori Mika kantoku Pūru nitsuite.” oshiete goo. Accessed: August 02 2012.
poomaa_chen. 2009. “Kantoku ga chigau.” yahoo question and answer webpage. Yahoo Japan. Accessed: August 02 2012.
pretty_kitten. 2010. “Pūru.” 2010. Excite Blog. Accessed: August 02 2012. Russell, Catherine. 2011. “Classical Japanese Cinema Revisited.” Continuum. Saito, Yoko. 2010. “Koizumi Kyȏko Kamome Shokudȏ No Shirīzu Ni Herushinki Kara Itayouna Kao De Sansen.” Cinemacafe.net. Accessed: August 02 2012. Schilling, Mark. 2012. “Rentaneko: Warm Humor within a Whisker of Loneliness.” Tokyo, Japan Times. Accessed: August 01 2012. Shinohara, Konta. 2011. “Hōga Pūru.” user blog. Rakuten Blog. Accessed: August 02 2012.
shokora. 2011 “Customer Review of Motherwater.” Amazon Japan. Accessed: August 02 2012. Wilentz, David. 2007. “Dream So Real: And Interview with Miwa Nishikawa.” 2007. The Brooklyn Rail. Accessed: August 1 2012. Barber Yoshino. Dir. Naoko Ogigami. EuroSpace, 2003. Film. Dear Doctor. 2009. Dir. Miwa Nishikawa. Asmik Ace Entertainment. Hebi ichigo (Wild Berries). 2002. Dir. Miwa Nishikawa. Xanadu. Hoshino-kun Yumeno-kun. 2000. Dir. Ogigami Naoko. Happinet Pictures. Kamome shokudo (Seagull Diner). 2006. Dir. Naoko Ogigami. Media Suits. Koi wa go-shichi-go (Love is 5-7-5). 2005. Dir. Naoko Ogigami. Cine Quanon. Mazā Wōtā. 2010. Dir. Kana Matsumoto. Suurkiitos. Megane (Glasses). 2007 Dir. Naoko Ogigami. Nikkatsu. Pūru. 2009. Dir. Mika Ohmori. Suurkiitos. Rentaneko. 2012. Dir. Naoko Ogigami. Paradise Cafe. Shiawase no pan. 2012. Dir. Yukiko Mishima. Asmik Ace Entertainment. Shiawase no suicchi (Happiness Switch). 2006. Dir. Yasuda Mana. Tohokushinsha Films. Tokyo Oasis. 2011. Dir. Kana Matsumoto. Suurkiitos. Toiretto (Toilet). 2010. Dir. Naoko Ogigami. Showgate. Wandāfuru raifu (After Life). 1998. Dir. Hirokazu Kore’eda. Artistic License. Yumeuru futari (Dreams for Sale). 2012. Dir. Nishikawa Miwa. Asmik Ace Entertainment. Yureru (Sway). 2006. Dir. Miwa Nishikawa. Bandai Visual Company. Frames # 3 Promotional Materials 05-07-2013. This article © Colleen Laird. This article has been blind peer-reviewed.